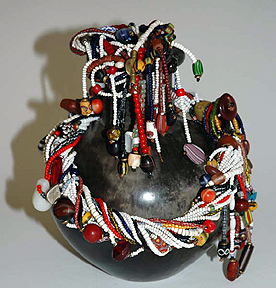 The bold innovative jewelry creations of Nasimiyu Wekesa will be accessorizing one of the glamorous Couture Fashion Week runway shows in New York in February 2009. The original jewelry designs will be shown on the catwalk along with the dramatic creations of designer and producer Andres Aquino on Saturday 14 February 2009 at 4:00 p.m. at the world-famous Waldorf-Astoria Hotel. A native of Kenya, Ms. Wekesa now resides in California where she pursues her dual passions of jewelry making and philanthropy. In 2003 she founded the Born To Aid foundation which helps needy children in her native village. A portion of the profits from her boutique are donated to the foundation, and her designs have been shown and sold at other charitable functions including a recent sale in collaboration with the Urban Zen Foundation, co-founded by designers Donna Karan and Sonja Nuttall. Ms. Wekesa's unique jewelry designs continue to grow in popularity and have become favorites of celebrities including supermodel Christy Turlington and Patti Scialfa Springsteen, wife of "The Boss", rock legend Bruce Springsteen. Couture Fashion Week is a multi-day event showcasing couture and luxury fashion. It also includes exhibits of luxury brands and fine art as well as world-class entertainment and receptions. The event is held in top venues in New York City, Palm Beach, Florida and other selected cities and is attended by upscale consumers, invited VIPs, the press and high-end store buyers. Couture Fashion Week offers unique branding opportunities for luxury products and services. Learn more about Couture Fashion Week. You may have interest in reading a few past articles regarding Couture Fashion Week.